2015 Jaguar XE - prices, specs, residuals, servicing costs, pictures and video | What Car? The Jaguar XE is available to order now, ahead of deliveries in May 2015. Prices start from £26,995 for the entry-level petrol-engined car and climb to £44,870 for the current range-topping performance S model. The likely best-seller, powered by a 161bhp 2.0-litre diesel and emitting 99g/km of CO2 in manual form, will cost from £29,775. Industry valuation companies such as Kee Resources and CDL state the Jaguar XE will offer stronger residual values than its key German rivals, over three years or 30,000 miles, retaining 45 per cent of its value. The full spec and pricing information for every model of the Jaguar XE, which is an Audi A4, BMW 3 Series and Mercedes C-Class rival, is outlined below and at the end of this story. Jaguar officials say that, as well as eclipsing its rivals through a combination of cutting-edge chassis, engine and in-cabin technology, plus striking design, the XE must lead Jaguar from being a popular but small-scale car maker in to a global powerhouse with ambitions to rival those of its premium German rivals. We invited What Car? readers to preview the new XE. Watch the video below to find out the results. The most efficient Jaguar XE, powered by a new 161bhp 2.0-litre diesel engine with 280lb ft of pulling power, will deliver average economy of 75mpg and emissions of just 99g/km of CO2 when equipped with the six-speed manual gearbox. When linked to the eight-speed automatic those figures are 104g/km of CO2 and 71.7mpg. Those figures make it the most efficient Jaguar ever built and eclipse the best currently offered by rivals. The BMW 3 Series Efficient Dynamics model, for instance, is powered by a 161bhp 2.0-litre diesel engine with 280lb ft of pulling power, and averages 68.9mpg and emits 109g/km of CO2. However, both BMW and Mercedes are preparing to launch new engine variants of their models within a year, the figures for which have not been revealed. Furthermore, with prices for the most efficient Jaguar XE starting at £29,775, it also has a higher list price than the BMW 3 Series Efficient Dynamics, which costs £28,775 and which currently has a discounted What Car? Target Price sales price of £26,719. In addition, there is a BMW 3 Series Efficient Dynamics Business, which has more standard kit than the base car, and which has a list price of £30,175 but a Target Price of £28,016. Jaguar is unlikely to offer a discount on the XE from launch, because of initial demand, but traditionally it has started to discount its models six to 12 months after launch. The nearest equivalent Mercedes C-Class C220 Bluetec SE emits 104g/km of CO2 and averages an official 70.6mpg. It has a list price of £29,365 and a Target Price of £27,187. It has a 168bhp 2.2-litre diesel engine with 265lb ft of pulling power and records a 0-60mph time of 7.7sec. The Audi A4 2.0 TDI 163 Ultra SE offers similar performance for a slightly lower list cost, but is soon to be replaced. The Lexus IS 300h SE matches the Jaguar’s CO2 rating of 99g/km and averages an official 65.7mpg but is cheaper to pay company car tax on because of its petrol electric drivetrain. BMW's 3 Series Efficient Dynamics Business has a Benefit-in-Kind tax charge of 17 per cent, while Jaguar claims the XE 2.0d 163PS version undercuts its German rivals, at 15 per cent. The list price difference between a manual and automatic Jaguar XE is £1750. To work out the full company car tax implications of any car, use What Car?’s Company Car Tax Calculator. Buyers also have the option of buying a Jaguar XE 2.0d 180PS. It is powered by a 178bhp 2.0-litre diesel engine with 316lb ft of pulling power. 0-60mph takes 7.4sec. Fuel consumption is rated at 67.3mpg and emissions at 109g/km of CO2 with both the manual and automatic gearboxes. Prices start from £30,275, with the premium over the equivalent 161bhp powered car between £500-700. This step up in power pitches the XE between the BMW 3 Series 320d SE, which has a list price of £28,775 and Target price of £24,130, and the BMW 3 Series 325d SE, which costs from £30,575, but which has a Target Price of £25,616. The 320d SE is powered by a 181bhp 2.0-litre diesel engine with 280lb ft of pulling power. It averages an official 62.8mpg and emits 120g/km of CO2. The 325d SE has a 218bhp 2.0-litre diesel engine with 369lb ft. It averages 57.6mpg and emits 129g/km of CO2. Likewise, the XE’s performance, efficiency and pricing sit it between the Mercedes C-Class C220 Bluetec SE outlined above, and the Mercedes C-Class C250 Bluetec SE, which costs £32,020 and has a Target Price of £30,413. It has 201bhp, 369lb ft of pulling power and average 65.7mpg while emitting 117g/km of CO2. These new, efficient diesel engines will be part of a new range of all-new turbo-charged four-cylinder petrol and diesel engines from Jaguar, branded as Ingenium and which, the firm says, will deliver class-leading fuel efficiency, refinement and performance. The engines are said to be up to 80kg lighter than the current equivalent units, and more units will be introduced in the coming years. As well as the low emissions and high fuel economy contributing to low running costs, VED road tax and company car taxation, the diesel engines have service intervals of 21,000 miles or two years. Both diesels will be available in a choice of eight trim levels: SE, Prestige, R-Sport, Portfolio, SE Auto, Prestige Auto, R-Sport Auto and Portfolio Auto. The new Ingenium engine family will initially be focused on efficient four-cylinder diesel engines, but insiders say a new variant of the engine will be launched every three to six months for the next two years. Other engines in the range will continue to be Ford units, modified to JLR’s requirements. Servicing and maintenance costs of the XE look set to undercut rivals, too. Jaguar is keen for the XE to be affordable to run, so it is offering fixed-cost servicing options for the diesel models. A one-off payment of £475 will cover all servicing for up to 50,000 miles or five years, depending on what comes first. For owners expecting to cover higher mileages, £659 gets the same five year coverage but for up to 75,000 miles. The service plans are transferable if the car is sold on during the covered period and covers the cost of replacement parts to secure an MOT certificate in for years three, four and five. Service plans for petrol-powered models are still under development. UK sales expectations for the two mainstream petrol-powered Jaguar XE models are limited, because of the predominance of diesel owners in this company car dominated class. The base petrol XE is the cheapest in the range, with prices starting from £26,995. The 197bhp 2.0-litre unit produces 206lb ft of pulling power and achieves 0-60mph in 7.1sec. Average fuel economy is 37.7mpg and CO2 emissions are 179g/km. The 237bhp 2.0-litre engined XE starts from £33,095. It produces 250lb ft of pulling power for a 0-60mph time of 6.5sec. Average fuel economy is 37.7mpg and CO2 emissions are 179g/km; both figures are identical to those of the lower powered units. Both 2.0-litre petrol models will be available with the automatic gearbox only. No service interval figures for the petrol engines have been released. Jaguar also says that the engine bay layout has been exhaustively engineered to ensure key parts are easily accessible, bringing down the cost of servicing and helping to reduce the XE's insurance rating. The Jaguar XE S will be available from launch and is powered by a supercharged 335bhp 3.0-litre V6 engine that powers the XE from 0-60mph in 4.9sec and delivers 361lb ft of pulling power, taking it to a limited top speed of 155mph. Prices of the Jaguar XE S start from £44,870, while it averages 34.9mpg and emits 194g/km of CO2. The engine is a modified version of the unit that powers the base Jaguar F-type, and the performance on offer in the XE is broadly comparable with the £39,310 Audi S4, which produces 335bhp, 325lb ft and hits 0-60mph in 5.0sec. Other rivals could include the slightly less powerful BMW 335i M Sport, which has a list price of £38,260 but Target Price of £31,837. It is powered by a 302bhp 3.0-litre engine that has 295lb ft of pulling power and hits 0-62mph in 5.5sec. Mercedes, Lexus and Infiniti do not currently have equivalent rivals in their ranges. The XE S will be differentiated by an 'S' badge on the front grille. The car also features a deep front bumper, black mesh grille and large air intakes. Depending which engine you opt for, there are up to four different Jaguar XE trim levels to choose from. The full run down of which trim level is available with which engine is at the end of this story. Entry-level Jaguar XE SE models are equipped with cloth seats and the door trims finishers are gloss black. Other standard kit includes sat-nav, cruise control, 17-inch alloys, DAB digital radio and a leather steering wheel. Jaguar XE Prestige models get heated, cross-stitched leather front seats and blue ambient lighting. Door trim finishers are brushed aluminium. Buyers can also specify air-conditioned seats. The Jaguar XE Portfolio buyers have a choice of leather colours, while the instrument panel is finished in two separate coverings. The aluminium trim finishings are also embossed on the surface. Additional kit includes an upgraded Meridian audio system, 10-way electric front seats, bi-xenon headlamps with LED daytime running lights and 18-inch alloy wheels. Jaguar describes this trim level as the most luxurious it offers. The Jaguar XE R-Sport package includes leather seats, etched aluminium door finisher colouring, and R-Sport branding on the tread plates and sports steering wheel. The rear of the car also gets a rear spoiler and the side vents are finished in chrome. R-Sport cars also get sports suspension, plus LED daytime running lights, gloss black window surrounds and two-tone 18-inch alloys. The S model gets leather seats and the tread plates and leather sports steering wheel carry an S logo. The centre console is gloss black, while the door finishers are a dark hex aluminium colour. Side sill extensions, a rear spoiler and red brake calipers are standard. The Jaguar XE sits on a new aluminium intensive platform architecture that will be used across variety of new products, including a new Jaguar SUV which is expected to go on sale around 2016. Jaguar says it is a world leader in lightweight aluminium construction thanks to its historic use of the material in cars, claiming the new structure is the the most advanced available in the world. The XE is also, it says, the lightest, stiffest and most aerodynamic Jaguar ever built as a result of this platform technology – and that this lightness is what underpins its fuel and emissions efficiency plus impressive handling and ride characteristics. The ride and handling are also enhanced by the unique suspension setup, influenced in part by that used on the Jaguar F-type sports car. The XE uses suspension technology which is more commonly associated with bigger, more expensive cars. Insiders say this is because Jaguar prioritised benchmark ride and handling characteristics as a way of making the XE stand out from its rivals. Furthering the use of aluminium, some of the suspension parts are made from the material to lower weight in this critical area. Underlining this efficiency drive, the XE will also get the company’s new electric power steering system. Until now, Jaguar has eschewed such systems as it didn't believe they provided the same level of feel as a mechanical set-up. However, Jaguar says that the technology is now far more advanced than when rivals first used it, and that the economy benefits and low-speed manoeuvrability benefits are matched by the level of steering feedback. Although the XE has yet to be tested, Jaguar is also predicting that it will score a full five-star Euro NCAP crash test result. This is thanks to the strength of the aluminium architecture and the presence of active safety systems including a pop-up bonnet which is triggered when a pedestrian hits the front of the car, so that it is less harmful in a second impact. Other technology firsts for the XE include an All Surface Progress Control system, which works as a low-speed cruise control function in slippery conditions. It has been developed with assistance from sister company Land Rover, with the aim of giving the rear-wheel-drive XE better traction when pulling away on low-grip surfaces up to speeds of 18mph. By controlling the throttle and brake controls without the driver having to make inputs, it delivers the ideal power through each wheel without letting them slip or slide. The XE also has stereo sensors as standard, which scan the road ahead and which can trigger the brakes if the potential for an impact is detected. This auto-brake system can act to either reduce an impact speed or bring the XE to a standstill, depending on the time it has to react. 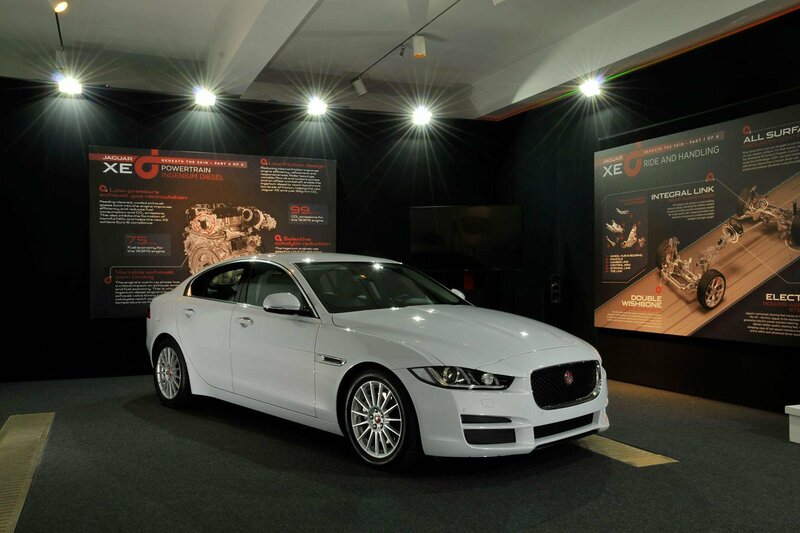 The sensors also control the XE's lane departure warning and traffic sign recognition technology. Another innovation is a colour head-up display system, which projects information such as the car's speed and sat-nav instructions on to the windscreen so the driver doesn't have to take their eyes off the road. Emphasising that such technology doesn't add unnecessary weight, Jaguar says its display unit is a third of the weight of those used by rivals. In addition, Jaguar stresses that the design and engineering departments working together to reach the best solutions to each others demands. As a result, company officials say, the XE structure is perfectly proportioned, with a short front overhang, longer rear overhang and – when viewed in profile – a cabin pushed towards the rear of the car, to give it a sporty, coupe-like look. It is also the most aerodynamic Jaguar ever built, with a drag coefficient of 0.26. That compares to the BMW 3 Series’ drag coefficient of 0.26. ‘Our design brief was to create an exciting and dynamic design clearly reflecting the XE's positioning as a serious driver's car,’ says design director Ian Callum, who says that he deliberately used some of the Jaguar F-type sports car's styling touches on the car to give it a sporty look. These include the taut, sculpted bonnet and the lines of the rear corners. The LED running light design, called J-blade, is also a look adapted from across the Jaguar range. The interior also takes several design cues from the F-type, including the design of the dashboard dials and the cockpit-like area which wraps around the driver. Jaguar also says that the XE has ‘generous’ amounts of leg- and headroom in the front and back, although it has yet to give specific measurements. Other highlights include a choice of fabrics and leathers, stitching styles and wood veneers, to give the car a handcrafted look. Ambient lighting that can be switched between 10 colours will also be available. The XE also has a new generation infotainment system – an area where Jaguar has traditionally lagged behind rivals. It is operated using a central 8.0-inch touch-screen or voice control functions. The so-called InControl media system is designed to integrate with a driver’s smartphone, both to control the car functions and manage their day while on the road. InControl Remote allows Apple and Android smartphones to remotely control a range of vehicle functions, including pre-setting of the XE’s climate control system, securing the car or even starting the engine. From inside the car, the InControl Apps setup lets users control smartphone services without touching the handset, using the vehicle’s touch-screen. The XE also has a Wi-Fi hotspot, allowing devices to connect to the internet using the car’s antenna, rather than its own data connection. The Jaguar XE is slightly longer and wider than a BMW 3 Series, but a fraction lower. Boot space is a claimed 455 litres – the Audi A4, BMW 3 Series and Mercedes C-Class all have 480 litres. The boot opening can also be powered, while the rear seats split 40:20:40 for maximum flexibility. Order books are now open for the Jaguar XE, with deliveries expected to begin around May 2015, while demonstrator vehicles will arrive at dealers late-April. We hope to test the car early in 2015. Given Jaguar’s heritage and the fact it has made so much of the XE’s driver focus, a Jaguar XE RS to rival the BMW M3 is certain to go on sale in around 18 months, while other bodystyles including a coupe and estate are also under consideration. No Target Price data will be available until the car is on sale, but the brand's reputation in the UK is likely to mean that early orders are significant and discounts aren't available initially. Company boss Dr Ralf Speth has also said that Jaguar XE discounts are unlikely to match those offered by rivals because of modest sales targets and a desire to protect residual values in the long-term. To meet the ambitious projected sales volumes globally, however, we would expect discounts of at least 5% to be available midway through 2015; even the established big-hitters in the segment such as Audi, BMW and Mercedes offer 10% discounts at present. 0-60mph 7.9sec (manual), 7.7sec (auto); Top speed: 141mph (manual), 132mph (auto); Power 161bhp; Torque 280lb ft; Fuel economy 75.0mpg (manual), 71.7mpg (auto); CO2 emissions 99g/km (manual), 104g/km (auto). 0-60mph 7.4sec (manual and auto); Top speed: 142mph (manual), 140mph (auto); Power 178bhp; Torque 316lb ft; Fuel economy 67.3mpg (manual and auto); CO2 emissions 109g/km (manual and auto). The Jaguar XE is being built at the Solihull factory, and once it is up and running at peak capacity an XE will come off the production line every 78 seconds. The new state-of-the-art manufacturing facility is part of a £1.5 billion investment by Jaguar Land Rover. Insiders say that the Jaguar XE has been designed to be a driver’s car - and, as such, it is aimed at taking that mantle from the BMW 3 Series. To achieve the ideal 50:50 weight distribution, engineers decided to use heavier steel doors instead of aluminium versions – without them, the weight distribution would have been 47:53. A bare XE bodyshell weighs 251kg – less than any of its class rivals. There are 3178 potential parts that can go on an XE. The factory in which the car is built has more than 600 robots wielding 456 rivet guns that will insert 2722 rivets in each car. The car is also glued together, with each one requiring 115m of glue.